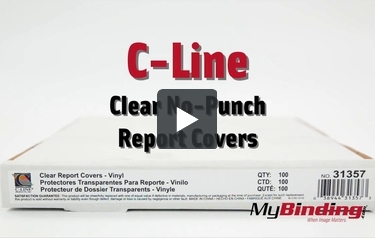 These C-Line Clear Vinyl No-Punch Report Covers are simple looking report covers that can make any letter-size document look more professional. Insert your files into the Poly Report Cover to not only store and protect your papers, but also make your hand-outs look more presentable. These report covers display a more traditional look with a heavy feel. Clear finish is perfect for showcasing your materials and makes presentations appear bold and bright. Use as report covers or to separate and identify other important information in your files or on your desktop. Get 100pk on every order. Transcript: Welcome to MyBinding.com. These are the Clear No-Punch Report Covers from C-Line. To keep your reports protected from the elements and give them a slick glossy finish, choose C-Line. These report covers are made from the highest quality vinyl for crystal clear viewing and waterproof protection. These covers give your report a more traditional look with a heavier feel, perfect for showcasing your hard work and you don’t have to punch holes through your pages. Give your reports the presentation they deserve with C-Line report covers. Welcome to MyBinding.com. These are the Clear No-Punch Report Covers from C-Line.